I have a thing for breakfast sandwiches and grilled cheese. With a current abundance of potato rolls some of them inevitably ended up as grilled cheese breakfast sandwiches. But, as you can see from the pictures, I didn’t put the cheese inside. Nope, no melty cheese here. It’s all crispy, crunchy, frico-style cheese for the win! If you haven’t had frico cheese, you NEED to. It’s basically everything that is delicious about cheese. Usually I’m all about the ooey-gooey-ness of cheese, but sometimes, crisp and crunchy is the way to go. If you’re the kind of person who likes the crunchy edges of lasanga, you’ll love fricos. They’re super simple too: all you do is heat up cheese over low heat until it bubbles, crisps and caramelizes. 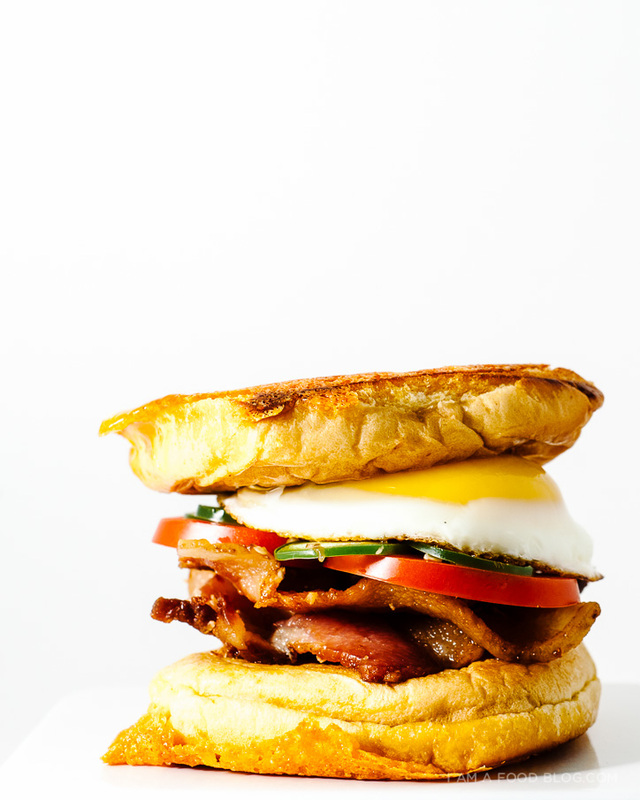 Adhere it to a soft and squishy potato bun and sandwich up bacon, tomatoes and jalapeños and you’ve got yourself the ultimate breakfast sandwich. 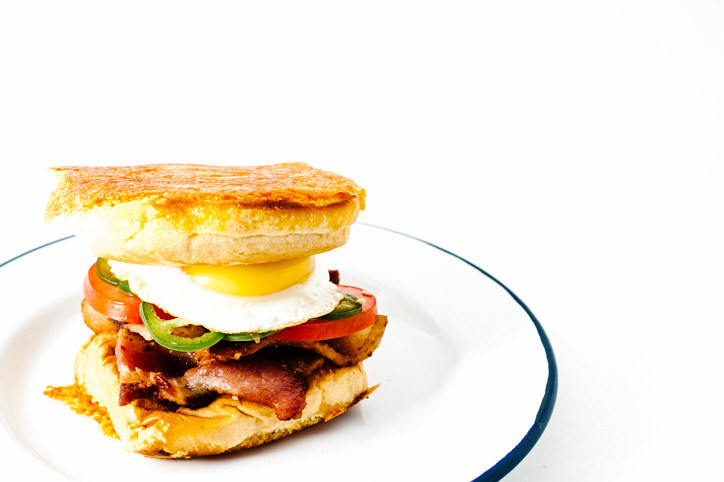 Hope your weekend is filled with breakfast sandwiches, sunshine and happiness! Heat up a non-stick pan (big enough to fit your buns comfortably) over medium-low heat and sprinkle the cheddar in the rough shape of your buns. Add the buns, cut side down and grill on medium-low until the cheese is crispy and golden. 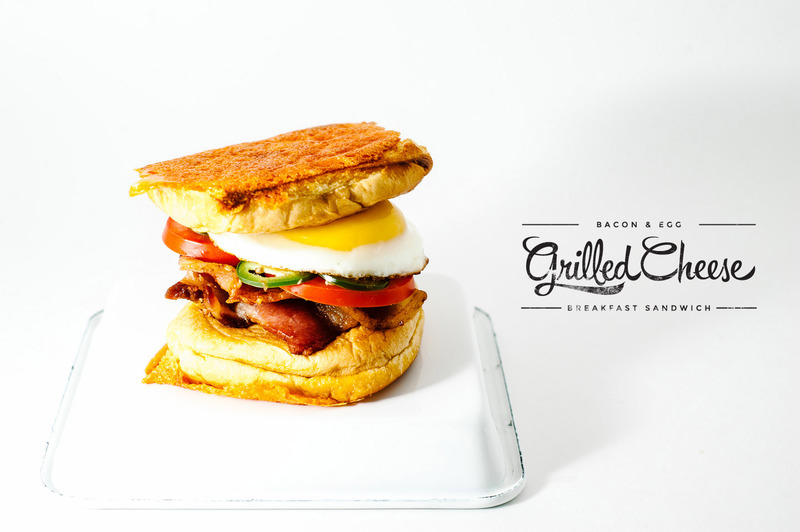 While your bun is getting all cheese-toasty, cook your bacon and egg as desired. 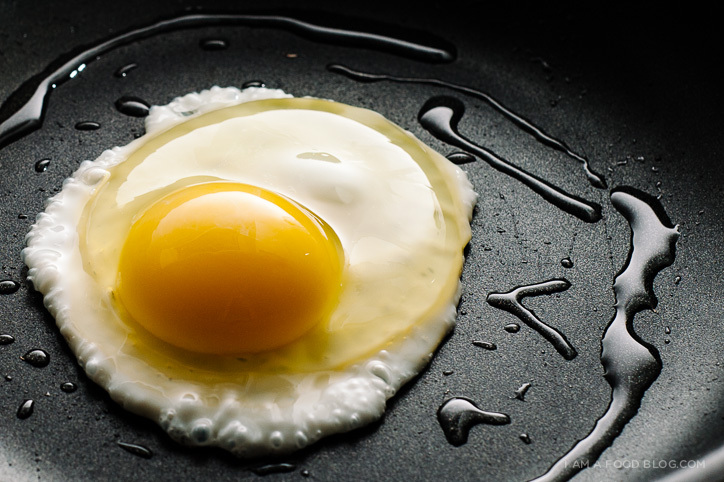 I like to cook both on a medium-low heat – the bacon fat gets rendered out, leaving it super crisp and cooking the egg on low ensures that perfect fried egg look. 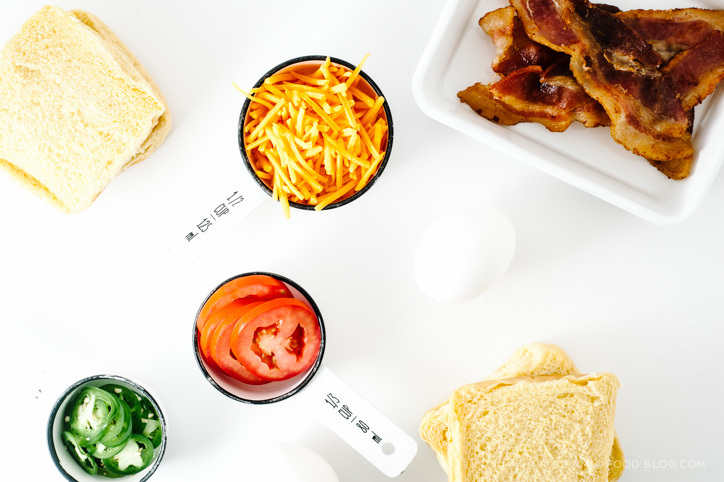 When everything is done, assemble your sandwich: Crusty cheese sides facing out (or in, if you want to keep your hands clean), bacon, tomato, jalapeños, fried egg seasoned with salt and pepper and your top bun. Enjoy! Love grilled cheese as much as I do? Check out some of the grilled cheeses of my past: Brussel Sprouts Grilled Cheese, Pierogi Grilled Cheese, Classic Grilled, Crab Rangoon Grilled Cheese, Grilled Egg and Cheese, Broccoli and Cheddar Grilled Cheese. ohmygosh it’s like inside out!!!!! i love it. Pass that plate, please. This sandwich looks just insane. Also, seeing that ‘preorder easy gourmet’ ad (which has been there all along) reminded me that I REALLY need to do that. Can’t wait to hold your book baby in my arms and wipe my drool off its pages. omg girl you are on fire lately! everytime i visit your page, i drool/my jaw drops open. this recipe is no exception, gah! 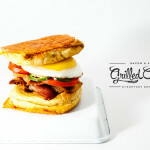 i love breakfast sandwiches, and this grilled cheese twist is pretty bomb. Mmm this looks soooo good. What if I do melty cheese on one bun and frico cheese on the other? I know, I’m getting crazy. Ever try grilled cheese? Like cheese actually grilled? I had it in Rome and it was delish. Slices of grilled Parmesan were served on top of grilled veal chops. My mouth is watering thinking about it. UM, frico cheese just blew my MIND. This is amazing, Steph! You always make me drool. The crispy frico cheese edges? With the runny yolk? All killer, no filler. Seriously… Your photography and graphic design is OUT of control and I’m totally in love with it. Even if you made the worst food in the world (thank goodness you don’t) I’d still come back every day for another dose of your photos and design skills!! OMG this is so awesome!! I love the idea!! Also, your photos are mouth watering!! this is too delicious! love the recipe and again your photography is so beautiful… thanks for sharing another great recipe! That is a serious egg sandwich! Love the inside out grilled cheese idea! Made this for brunch today and it was fabulous! Thanks for the recipe! !